The North American market for all-electric presses continues to be promising. Hydraulic injection molding machines still account for about half the presses operating in North America, even though electric machines are dominant elsewhere in the world. 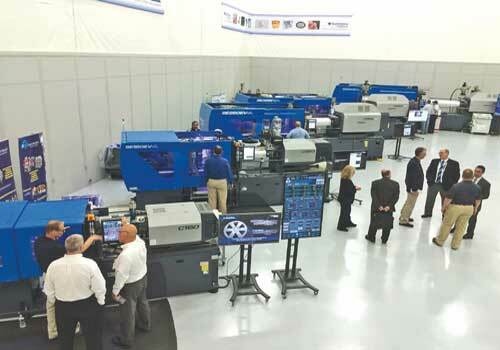 Sumitomo (SHI) Demag Plastics Machinery took steady aim at accelerating North America’s conversion to all-electric technology, when it made the global introduction of its newest platform, the SEEV-A, at an open house at its technology center in Strongsville. “Customers know they can mold smaller parts with exceptional precision on our electric machines, and for most molders in North America, all-electrics are synonymous with smaller-tonnage machines,” said John Martich III, vice president and chief operating officer of Sumitomo (SHI) Demag Plastics Machinery North America Inc.
“But the SEEV-A platform will change that small-tonnage perception in North America, and around the world,” Martich said. The event included technical presentations and five molding demonstrations on SEEV-A machines ranging from 56 to 562 tons of clamping force. The machines were selected to show off the versatility of the technology, with presses capable of micro-molding all the way up to shot sizes over 75 ounces, and for diverse applications including automotive, packaging, closures and medical. The SEEV-AHD presses range from 247 to 562 tons of clamping force, and the SEEV-A presses from 56 to 202 tons. The design of the presses allow them to accommodate bigger, heavier and more complex molds in smaller, more efficient machines. That saves on plant space, as well as energy consumption. Don Loepp Sumitomo’s SEEV-A presses range from 56 to 562 tons of clamping force. The presses featured the company’s Z-Molding technology, with three integrated technologies: minimum clamp molding, simple process setting and flow front control. Flow front control allows the machine to perform with complete and balanced filling of multi-cavity tools with reduced injection pressure. • A SE500EV-AHD (562 U.S. tons) ran a 31.1-inch, 14.1-ounce, polycarbonate automotive headlamp lens on a 54-second cycle. The hot runner system and mold were supplied by HRSflow and incorporated sequential molding technology. • A SE385EV-AHD (433 U.S. tons) ran a two-cavity, hot-runner mold for 5-gallon snap-on bucket lids, on a 14.5-second cycle. Each of the linear low density polyethylene lids weighed 12.2 ounces. The demonstration highlighted double center press platen (DCPP) design, which ensures even distribution of surface pressure on both the moving and stationary sides of the mold. • A SE250EV-AHD (281 U.S. tons) molded thin-wall, 50 milliliter polypropylene medical vials. The 11.5-gram parts ran on an 11.2-second cycle. The demonstration highlighted algorithm-based S-MOVE technology that replaces multi-step mold open/close speed settings with an optimized speed pattern that is smoother and 15 percent faster. • A SE180EV-A (202 U.S. tons) ran thin-wall, medical dosing cups on a sub 3-second cycle. The eight-cavity, hot-runner valve-gate mold was supplied by Caco Pacific with proprietary conformal cooling in the cores and cavities. • A SE50EV-A (56 U.S. tons) ran an eight-cavity, cold-runner mold, on an 18-second cycle, molding two sizes of acrylic paper clips: one weighing 0.79 grams and the other size weighing 1.35 grams. The demonstration highlighted FFC system, which was switched on and off to show the effect on the parts in this unbalanced or “family” mold in which four of the parts are 70 percent bigger than the other four parts. Martich said molders can expect a rapid return on investment with SEEV-A machines. “They’re solutions that open up the benefits of all-electric machines,” he said.